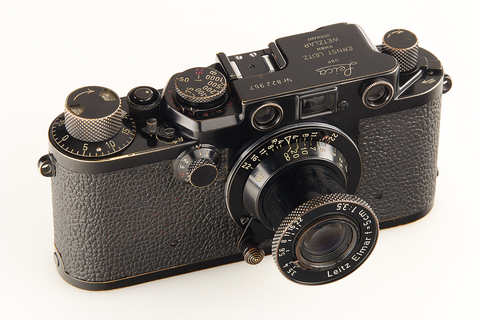 WestLicht, the world’s leading auction house for vintage cameras, is holding two auctions in November 2014 to celebrate two anniversaries, ‘100 years of Leica photography’ and ‘175 years of photography’. The WestLicht photo auction on 21 November 2014 puts the focus on pictures, while the WestLicht Photographica Auction on 22 November 2014 will be offering historical photographic equipment, including rare Leica products. All lots can be viewed online at www.westlicht-auction.com. Amongst the highlights of the WestLicht photo auction on 21 November are photographs shot by Diane Arbus. The photographer, born in New York in 1923, revolutionised and changed the face of photography. Amongst her pictures, many of which have long since become icons of the 20th century, Identical twins (Cathleen and Colleen) from 1967 (estimated value: 80,000 to 100,000 euros) is almost certainly the most well known. This, and three other of her works, like The King and Queen of a Senior Citizens Dance, New York 1970 (estimated value: 50,000 to 70,000 euros), are from her only portfolio entitled A Box of Ten Photographs, that was a concept produced in 1971, shortly before her death. The work of one great Austrian Leica photographer, Franz Hubmann, is also on display. Hubmann captured the greatest musicians and artists of his time in a way that only very few photographers could. His photograph entitled Pablo Picasso in his Villa La Californie, Cannes 1957 (estimated value: 3,000 to 3,500 euros) is particular proof of this. Vintage prints from Hubmann’s private collection of pictures the photographer was given by prominent international photographers (including Henri Cartier-Bresson, Otto Steinert, William Klein and Frank Horvat) in the 1950s and early 1960s are also up for auction. This selection from a further 190 lots is an impressive stroll through the history of international photography: Magnum co-founder Henri Cartier-Bresson captured the classic Women spreading out their saris, India 1966 in that year (estimated value: 9,000 to 10,000 euros), his fellow agency colleague Marc Riboud captured Street scene in Peking on film in 1965 (estimated value: 2,500 to 3,000 euros). These are two typical examples of many that illustrate the outstanding qualities of Magnum photographers, of whom works by Werner Bischof, Robert Capa, Inge Morath, Erich Lessing and René Burri are also on display at the auction. One day later, on 22 November, the camera auction will be presenting a total of 642 lots that show technical developments in the world of photography. Traditionally, the auction begins with Leica rarities (cameras, lenses and accessories) from the pre-war years, including from the well-known private collection of Dr Bawendi, a contributor of articles to VIDOM and for many years a member of the Leica Historica association. Other Leica cameras at the auction include wartime models and cameras made for military purposes. A particular highlight here is a black enamel Leica IIIf made for the Swedish armed forces in 1956 (estimated at between 50,000 and 60,000 euros). As in the past, Leica M cameras and lenses are once again one of the focal points of this auction. The M3 owned and used by Franz Hubmann and a self-portrait are estimated to fetch between 3,500 and 4,000 euros. The rarest camera is the very early black-enamel MP-24 from 1957 in mint condition (estimated value: 150,000 to 180,000 euros). This is followed by a number of rare Leica special editions, the highlight of which is the final camera of the Leica M Edition 100, a special edition celebrating the 100th anniversary of Leica photography and of which just 101 have been produced (estimated value: 50,000 to 60,000 euros). In another popular category for collectors, Leica copies, the absolute highlight is the famous Red Flag 20. Only very few of these Chinese camera copies of the Leica M4/M5 were ever made. As a camera with three lenses, the complete set offered here is particularly rare (estimated value: 45,000 to 55,000 euros). In addition to the cameras already mentioned the auction lots also include a series of KGB and Stasi (East German secret service) ‘spy cameras’ and a private collection of subminiature cameras.